Photographer Mike Sheil showing The Duke of Kent KG GCMG the exhibition at the official opening. Commissioned by The French Sénat 'Fields of Battle - Terres de Paix' was on display around the Luxembourg Gardens between April and August and was seen by over 2 million people. 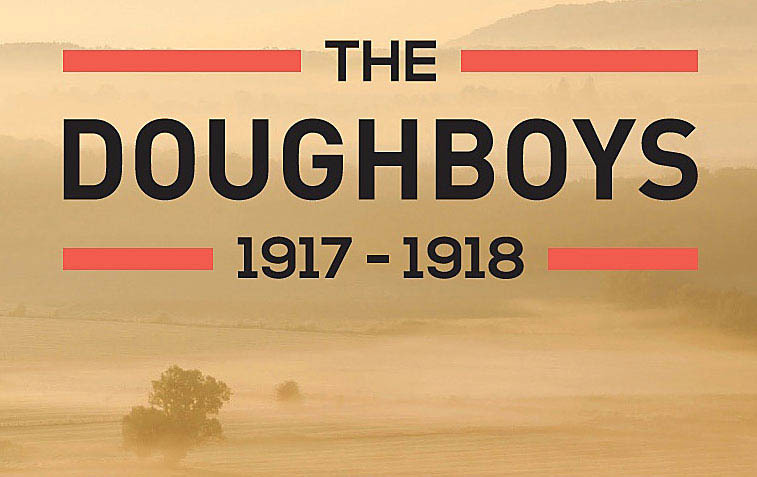 ‘The Doughboys 1917-1918’: This especial exhibition about the American experience in WW1 was commissioned by the U.S. National World War I Museum and Memorial and now forms part of the of U.S. World War One Centennial Commission’s commemorative programme. Here in the U.K. it ended its highly successful six city UK tour of the UK in Cardiff in September 2017: overall it was viewed by over four million people. Chicago: Friday 5 October - Sunday 18 November at the Navy Pier. Doran Cart - Senior Curator of the Museum, shares his thoughts on the exhibition which was on display in August 2017. "Over all the years that the National World War One Museum has been doing special exhibitions, the one that I'm going to talk about now is probably one of the most special"
Fox 4 News Reporter Matt Stewart interviews Mike Sheil in Kansas City on Memorial Day 2017. Photographer displays WWI battlefields as they look today at Liberty Memorial. KANSAS CITY, Mo. -- Veterans and their families gathered under the Liberty Memorial this morning to honor those men and women who died in battle. "The idea behind the photographs is they show lands which were once places of horror and killing, and today, you know, time and nature have healed the wounds of war and they're actually places of great beauty, and great peace and tranquility," said photographer and Keynote speaker Mike Sheil. 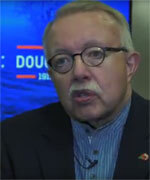 As the keynote speaker, he talked about the impact America had on the war. Sheil, a native of England, expressed his honor in being chosen to speak at the ceremony. The exhibition was on display at Liverpool One in the Summer of 2017. "It was brilliant to meet you. Thank you very much for bringing such an important exhibition to Liverpool to be hosted by Liverpool ONE. Your speech in the Town Hall and tour of the exhibition was so interesting, and the exhibition is stunning. Colleagues and I have been out on lunch times reading all the information, I think we’ll just about get all the way through before it moves to the next venue!" "During Fields of Battle's stay at Liverpool One, the footfall past the exhibition has been in the region of 420,000 per week, which equates to 2.5 Million during its stay here with us." 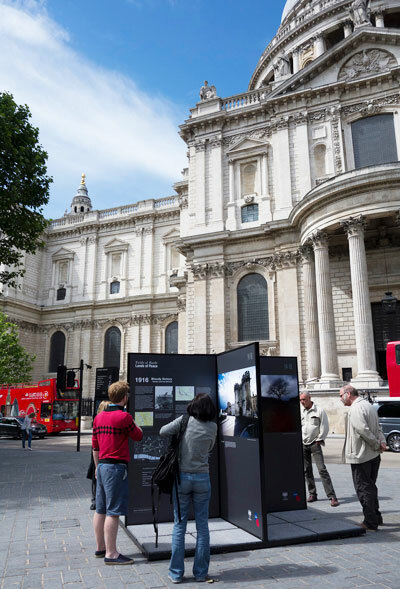 To mark the men of London who lost their lives during the Battle of the Somme, the City of London commissioned an especial exhibition entitled Fields of Battle, Lands of Peace: SOMME100. Generously sponsored by the Royal British Legion this was the first time that a photographic exhibition had ever been mounted in the Guildhall Yard which provided a magnificent setting for a programme of school visits sponsored by the London Stock Exchange group. Click to the left for a video profile of the exhibition as it appeared in Guildhall Yard, between June 1st and July 3rd 2016. 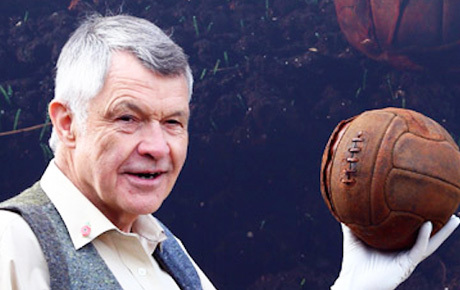 Featuring interviews with Photographer Mike Sheil and Historian Sir Hew Strachan, this short video also includes moving public feedback, together with schoolchildrens' thoughts on the exhibition and the First World War itself. 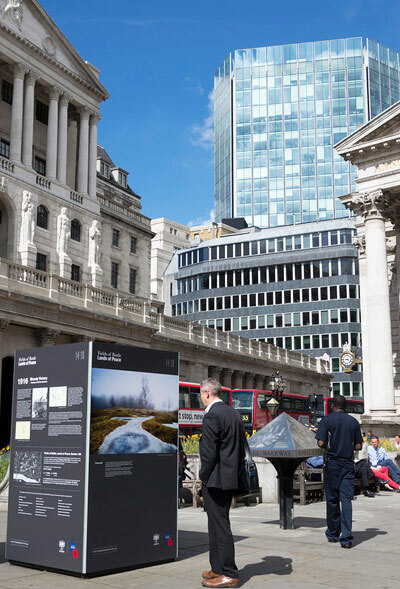 At the same time, a smaller exhibition, was presented around the City of London in such prominent locations as the Bank of England and St. Paul’s Cathedral. This exhibition presented the story of the Battle of Verdun and together, the two exhibitions were viewed by almost 70,000 people in just six weeks. CAN YOU HELP FIELDS OF BATTLE ACHIEVE ITS GOAL? 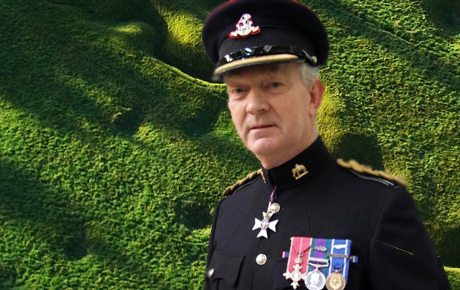 The Fields of Battle - Lands of Peace 1418 Charitable Trust is charged with raising a considerable amount to stage the exhibition and the trustees are only able to achieve this by securing sponsorship, grants and through the generosity of the public. Help us remember their sacrifice. Can you or your organisation help the project in any way? Please contact us or review our sponsorship packages here. This exhibition was mounted in Belfast in Belfast and Dublin with joint sponsorship from Belfast City Council and the Irish Department of Arts and Heritage. In Belfast it was mounted in the grounds of the City Hall whilst in Dublin it was presented in St. Stephen’s Green, which had itself been a battlefield in 1916. As a symbol of cross-border reconciliation its success can be judged by the fact that in Dublin the exhibition was transferred to Glasnevin Cemetery where its extended stay meant that the exhibition was on display in Ireland for a total of six months. The success of the Irish programme with its theme of reconciliation emerging from commemoration and which was created in partnership with the Causeway Institute for Conflict Resolution, is a matter of great significance for all parties. Forming part of Belfast City Council’s wider ‘Decade Of Centenaries: Reflections On 1916’ programme, Fields of Battle Lands of Peace was outside Belfast City Hall between July and August 2016. Click to the right to view a short video. (There is a delay of around 12 seconds before the video starts). Fields of Battle, Lands of Peace 14-18. Proven to attract large international audiences. In April - August 2014 the exhibition was hosted in Paris by the French Sénat on the railings of the Jardins du Luxembourg where it was seen by over 2.1 million people during this four month period. A subsequent exhibition was mounted with the support of the Heritage Lottery Fund and with the kind permission of The Royal Parks in St James’s Park, London, where 4.7 million visitors were recorded between August and November. This figure represented a 25% increase in visitors to the park over the same period for the previous year. The exhibition then travelled to Nottingham City Centre where it was on display to the public between September and November as a central component of the City's 'Trent to Trenches' commemorative events programme. In April 2015, the Turkish government commissioned a special exhibition for display in Istanbul and Ankara to mark the centenary of the Gallipoli campaign. In addition to the SOMME100 exhibitions in London and Ireland, in collaboration with the French Mission Centenaire 14-18, during 2016 we created an exhibition on the Battle of Verdun. Its location on the Champs Elysées in Paris created an exhibition viewing of over 600,000 before it moved to the City of Verdun for the formal ceremony of reconciliation between President Hollande and Chancellor Merckel. With a focus on education and ideal for adults and children alike, this engaging exhibition features meticulously researched content including archive images and fascinating facts to support Michael’s contemporary battlefield images. Click the button above to help us raise the necessary funds to ensure Fields of Battle and commemoration of The First World War reaches as many people as possible in their own communities throughout the United Kingdom.